In an effort to help my oldest son I have instituted a no electronics rule until 7 pm in our house. Basically my kids are only allowed 1/2 of electronics and then by 8 they have to be ready for bed and we read a science or history book for an hour. My oldest claims that I am a horribly mean mommy, however, he has come home with A's on all his tests and papers for the last week and a half. Personally I view the fact that my kids sometimes think my rules are mean as evidence that I'm doing a good job. I have never claimed to want to be my kids best friends. What I do want is for my kids to be successful adults and part of that means not reacting when the rules that I institute result in one of my kids telling me that I'm ruining their lives. In reality I'm doing just the opposite. It would be easier for me if tonight I just let my kids play Minecraft for hours while I caught up on my favorite television shows. Their future wouldn't be as bright though and that's more important to me than taking the easy route. I attempt to make everything I can from scratch. Having an herb garden helps tremendously since I can dry the fresh herbs and use them in spice mixes etc. Seasoning mixes are one of the easiest things to make at home and cost a fraction of the money of store bought. 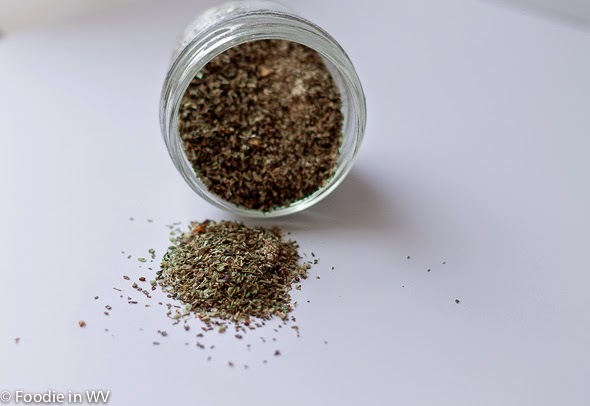 The following is a recipe for Homemade Italian Seasoning. Place all ingredients in a bowl, pestle, or spice grinder. Grind spices (with a back of a spoon if doing by hand) until the spice blend becomes coarse. Making simple pantry items at home can save a lot of money over the course of the year and taste so much better than store bought. Plus they make great gifts as part of a food gift basket! I wish I could say it gets better but the struggle as they get older with electronic distractions rages on :-) No worries, they do survive and we do too (barely). Your Italian seasoning looks really good. Homemade seasonings are excellent. Hope you had a good summer. The electronic distractions definitely can be irritating :) I think it has only gotten worse as they have gotten older! He will thank you some day. I am trying to make as many things as possible from the scratch too. Your Italian seasoning looks wonderful, Ann. Making things from scratch is so much cheaper and the taste is always better! You're not mean at all. I think you're doing the right thing. Thanks for the recipe. I love making my own spice blends, such as taco or fajita seasoning. I love making my own spice mixes, they are great! I love your italian seasoning! But now they have 20 always go to bed any time. Always Im the firrst in bed! My kids are hit or miss on going to bed. They will do the reading for an hour and then sometimes try to convince me to stay up later :) Kids are funny!